We learnt from Andus how the particular shape, size and nature of the cave houses went together with a particular set of social relations and food practices. And how now that most people live in conventional houses, these things have almost entirely died out, forever. Hence the old woman’s emotion at the end of our tandır session. There’s a lot you could write about this (a whole PhD in fact), but yufka – a kind of unleavened, multipurpose dough – is a good example, so I’ll stick with that. 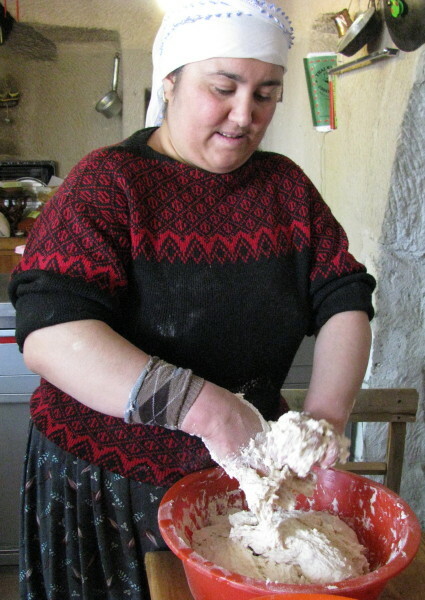 Back in the cave-living days, women would get together every few months for mammoth yufka-making sessions: The youngest would make the simple dough (flour, water, salt) and divide it into portions ready for rolling. 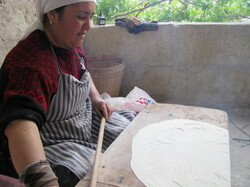 Those a bit more experienced would roll these out into large, perfect, paper-thin circles on low tables using a long, thin rolling pin called an ‘oklava’ (or ‘okla’ in village-speak). This is no easy task, judging by my deplorable attempts. And the oldest woman would expertly cook them on a large, shallow metal dome (‘saç’) over a roaring fire down in the tandır oven beneath, skillfully flipping the delicate disks with the aid of a long stick. It was a sociable event, lasting the entire day, and into the night if needed until all the dough was used up, in which women from an extended family and their neighbours could get together, tell stories, sing old songs, gossip, pass down important knowledge – culinary and otherwise – and form their own network. There being women from outside the family present, men were banished from the cave complex for the duration. Each session would be a team effort to stock up one woman’s household with all the yufka she’d need for the next few months. 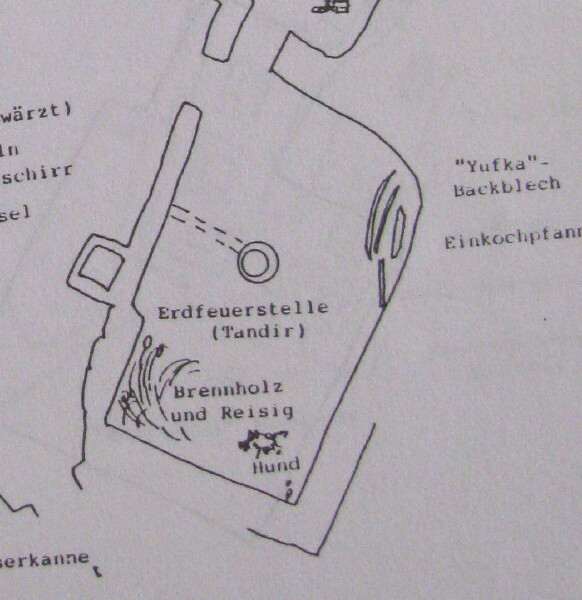 The constant temperature and humidity of the cave houses were perfect for yufka storage, and each dwelling had a designated yufka spot. 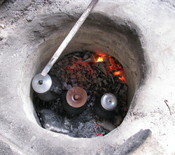 As needed, the dried yufka could be reconstituted and used in all sorts of ways. The team effort would rotate round all the women’s households. 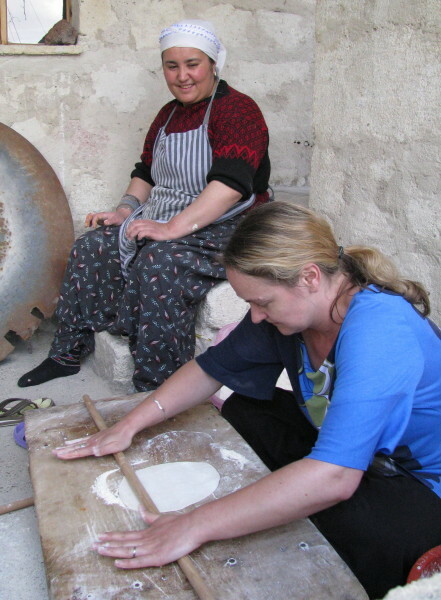 Considering women in traditional parts of Turkey do not have easy access to the public domain, the communal yufka-making sessions must have had important social functions as well as essential food-production ones. But the practice is now all but extinct. The concrete box houses are not conducive to communal baking sessions, and do not have the right conditions for yufka storage. Of course, they don’t have tandırs dug into their kitchen floors either. People are now in the habit of buying ready-made yufka or other forms of bread from the shop, and the younger generation isn’t interested and wouldn’t know how anyway. 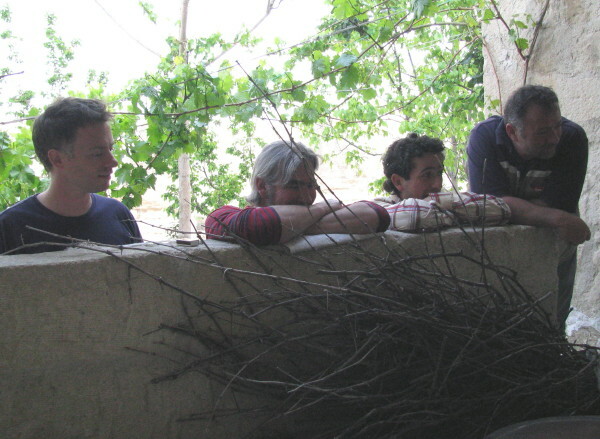 Gülcan and Andus have a tandır sunk into their veranda. When we encouraged them to fire it up, it was its first use in two years. Granny Hatice from next door was invited round to preside over it, since she was the person with the old knowledge, as grannies seem to be everywhere. I tried rolling yufka but was quickly demoted by Hatice – it was not my proper place. Fair enough – I was crap at it. Meanwhile the menfolk wisely kept their distance. 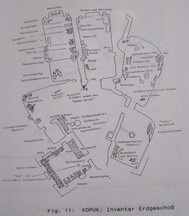 This was women’s work. Our lunch of all-you-can-eat gözleme was completed with glasses of cool, frothy ayran, and of course some çay. 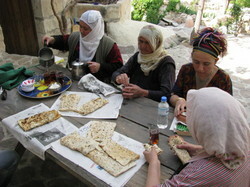 The table was spread with newspaper and great big piles of warm gözleme. They were delicious – buttery, golden brown and crispy on the outside, warm and savoury on the inside. I probably would have eaten all 50 of them if they’d let me! Of course, the tandır was still piping hot inside and no sane Cappadocian would waste all that heat. So Andus bravely lowered his top-half into the furnace, losing both eyebrows I should think, to place several earthenware jugs of stew into the ashes. 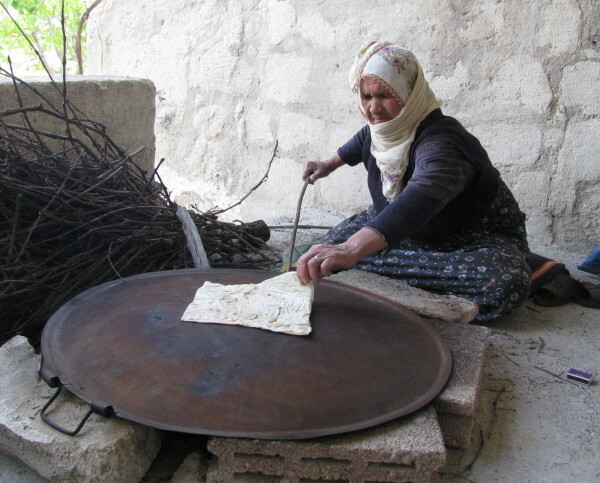 This is the traditional way to cook ‘kuru fasulye’ (dried beans flavoured with lamb bones), as we also saw at the village bread oven in Güzelöz (story to follow). The saç was replaced and covered with what looked like duvets and the air-vent was plugged, to trap as much heat as possible. The stews sat there for 24 hours, cooking slowly. Needless to say I’d loved every minute of the whole experience, and am glad it gave Hatice one last chance to preside over a traditional tandır session. 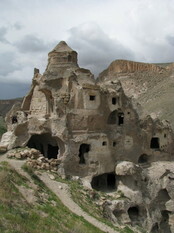 We had, albeit just for one day, recreated a scene that the rocks of Cappadocia had witnessed for maybe 1500 years. Thank you Gülcan, Andus, Hatice and Hamide. Cappadocia has become so touristy (the government’s intention when it moved everyone out of their caves), that real estate has rocketed as traditional old ‘fairy chimney’ homes are being bought up by outsiders to convert into luxury hotels. Hatice now cannot afford to live in her own village, and is about to move to an apartment block in the city down the road, where there definitely won’t be any tandır sessions. Cappadocia may be buzzing with thousands of tourists, but the way of life which made it such a tourist attraction in the first place, is sighing its last breath. I am so jealous. 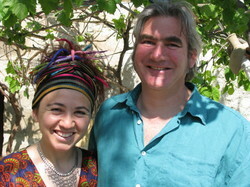 I am an energy anthropologist and would love food anthropology especially in this region and the middle east. How lucky you are!